Jimmy Keohane scored on his Woking debut as the Cards beat Welling United 2-0 at the Laithwaite’s Community Stadium on Monday afternoon. John Goddard headed home a Bruno Andrade cross to put the home side in front in the 62nd minute. New signing Keohane, who was released by League Two side Exeter last season, netted Woking’s second ten minutes after coming on to make it six games unbeaten for Garry Hill’s side. After a lacklustre opening 15 minutes, the game sparked into life when John Goddard fired just wide from inside the penalty area in the 17th minute. The midfielder linked up well with Andrade throughout the game, and the winger’s cross found Goddard in the box. However, he could only get an outstretched boot onto the ball as it flew comfortably wide. 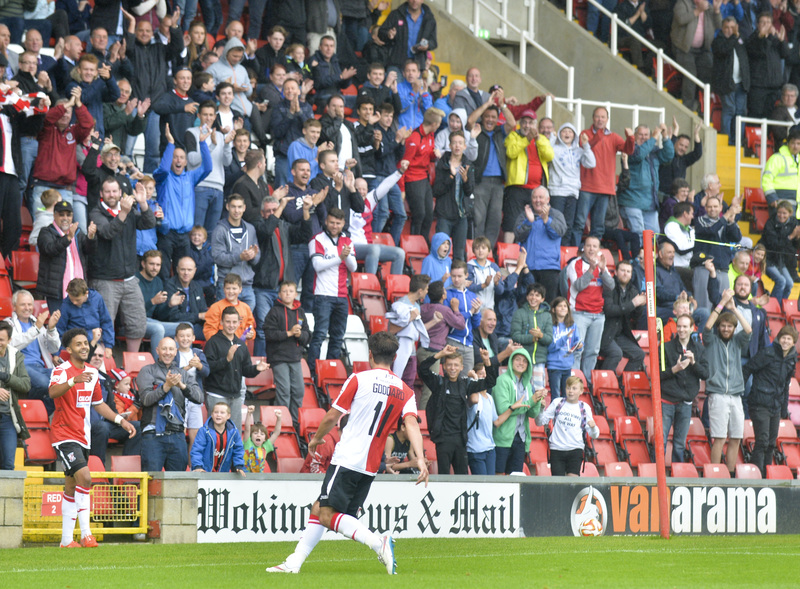 The Woking duo then linked up again shortly after, with Andrade’s knock-down finding Goddard in the penalty area. Despite having plenty of space, his effort was tame and easily saved by Welling goalkeeper Tom King. The lively midfielder again created another chance seven minutes later, but his shot fizzed wide of the target. Welling grew back into the game and looked more comfortable on the ball. After numerous blocked efforts, their first real chance of the game came in the 34th minute. Reece Harris took Jake Cole by surprise and his shot from an extremely tight angle smashed off the underside of the bar and fell to safety. Keiran Murtagh, who was captaining Woking in the absence of the injured Mark Ricketts, went closest for the hosts in the 38th minute. His long-range effort forced Welling goalkeeper King to make a fantastic finger-tip save to claw the ball away from the top corner. He almost gave the Cards the lead on the stroke of half-time when his strike slipped through the hands of King, on loan from Millwall, but the ball sailed onto the roof of the net. The visitors went straight up the other end with Xavier Vidal testing Cole from distance as an even first half ended goalless. Although Woking created more chances, it was the visitors who looked the most dangerous on the ball. 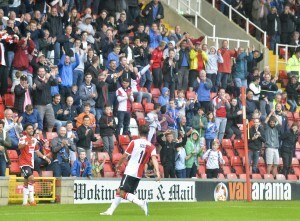 Woking responded early in the second half, with Andrade’s 49th minute shot fizzing over the bar and into the LGS Stand. The end-to-end nature of the first half continued two minutes later, Vidal forcing Cole to turn his long-range shot around the post and out for a corner. The home side took a deserved lead in the 62nd minute. Andrade’s cross from the left wing found Goddard at the far post and he headed the ball beyond King to score his fourth goal of the season. Woking doubled their lead 12 minutes from time courtesy of midfielder Keohane. He had only been on the pitch for ten minutes after replacing Kadell Daniel, but he slotted it into the bottom corner from 20 yards out to seal the result for his side. John Goddard celebrates scoring his goal. Vidal almost pulled a goal back for the visitors moments later, but his free-kick from the right wing went narrowly wide. Loui Fazakerley’s side had another chance of their own in the 81st minute, but George Porter’s header went high and wide of Cole’s goal. Woking then consolidated their lead in the remaining few minutes to move up to third in the Vanarama National League. They next travel to Macclesfield on Saturday with the Cards looking to go seven games unbeaten at Moss Lane. Woking XI: Cole; Caprice, Thomas, Saah, Arthur; Jones, Murtagh, Goddard (Pattie 86′); Daniel (Keohane 68′), Andrade (Mills 91′), Holman. Welling XI: King; Osborne, Lokko, Chambers, Jefford; Wellard (Awotwi 73′), Lee (Obafemi 82′), Corne, Harris; Vidal, Porter. All Photos are from the clubs website, taken by David Holmes.